From flea markets to fantastical spiritual village, The Magical Cures Series takes you on a whirlwind of mystery, murder, fairies and witches as June is convinced by her childhood friend to move into Whispering Falls, a spiritual and magical village. Welcome to Whispering Falls, Kentucky where there is more than MAGIC! 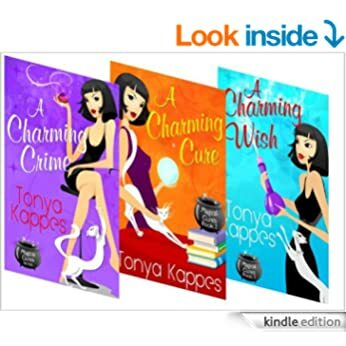 Get to know June Heal as moves into the magical village and discovers her true identity in this box set that include the first three BEST SELLING novels in the series: A CHARMING CRIME, A CHARMING CURE, and A CHARMING WISH. Found as a $.99 download on the kindle store. The series, is…well…charming. Kappes (whose name reminds me of the kappas in the Harry Potter novel, no offense to this author, just keeping in tune with magical books) does a decent job moving a story along, writing for a young adult or pre-teen audience-even middle aged adults. In the magical/paranormal genre, one has to suspend belief in reality and known timelines of events, as evidenced in this Charming Magical series. True-to-form, a young girl/woman prior unbeknownst to her, is a witch/paranormal/clairvoyant/psychic, is dragged into a paranormal business/leadership/dating venue, has mishaps/framed/blackmailed into performing deeds against her will. Predictable and saccharine yet still a fun read. Kappes knows how to draw the reader in and keeps the action fun and punchy, with crazy characters, a magical village, a magical university and magical businesses. While not for everyone, the series isn’t covering serious genre-breaking plots. It’s meant to be a getaway from normal, regular life. While fun, I do take issue with the main character’s unhealthy dependence on junk food and sweets. Kappes must keep in check that diabetes, heart disease can happen to her target audience. Such unhealthy snacks can be so detrimental to young (and old) bodies. She is not seen eating any other food items, no healthy vegetables, no lean meats, no dairy-which are so vital for young bodies. The main character is seen as independent, following her own mind, sleuthing and standing up for herself-which is what every young person, boy AND girl, must know about themselves. That they have value, can make up their own minds and stick up for themselves. So hats off to Kappes! I would give the series 4 stars, with reservations noted above.